Yes, we have some fantastic news to share! 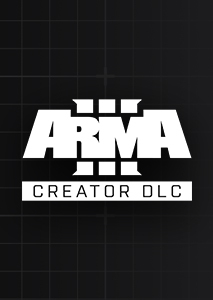 Last year we released the Laws of War DLC for Arma 3, and we announced that half of Bohemia Interactive's net revenue from direct sales of the Laws of War DLC in 2017 would be donated to the International Committee of the Red Cross (ICRC). Today we're excited to announce the total amount raised. 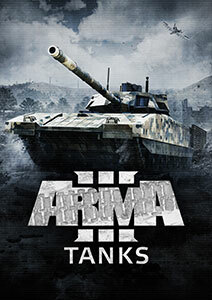 Thanks to your overwhelming response (Laws of War is currently the highest-rated Arma 3 DLC on Steam! 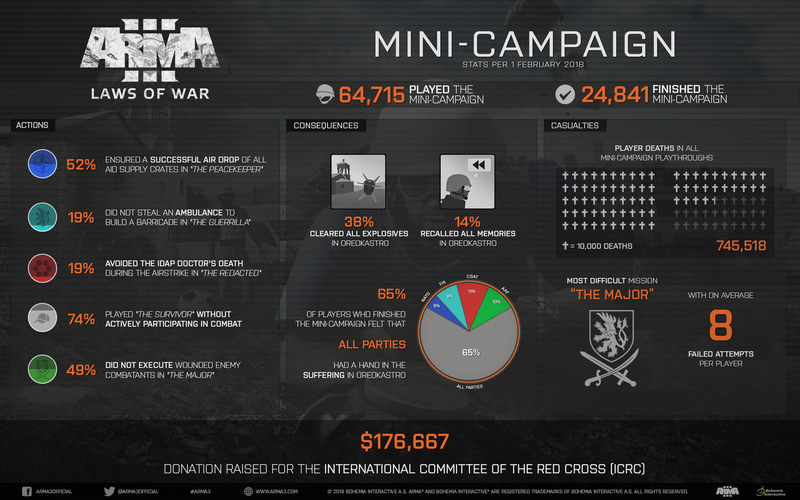 ), we've been able to donate $176,667 to the ICRC. With this donation, aid workers will be able to provide assistance to those affected by violence and armed conflict. It will help save and improve the lives of people who need it most. We salute you for your contribution! 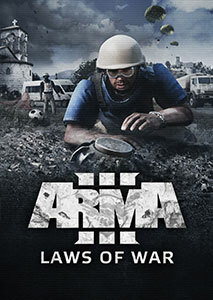 Laws of War is a downloadable add-on content pack (a.k.a. 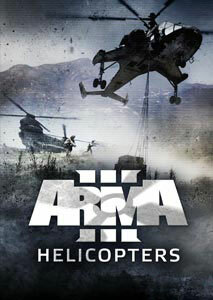 DLC) for Bohemia Interactive's military game Arma 3. 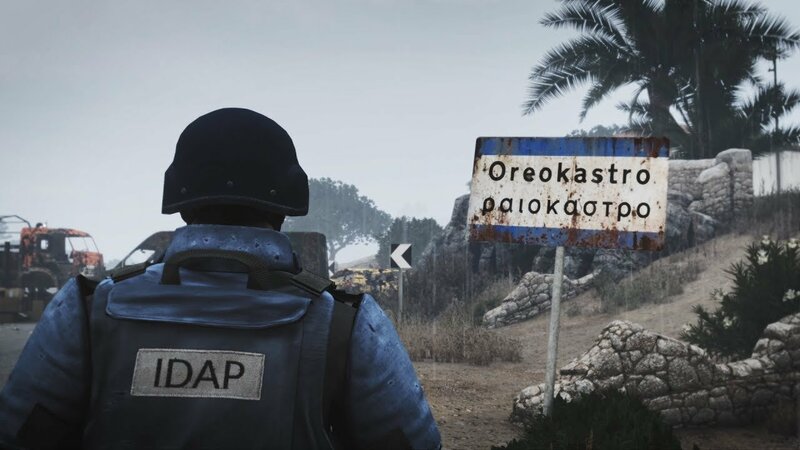 The package explores a different perspective on the battlefield by introducing a fictional humanitarian NGO faction called IDAP (International Development & Aid Project). 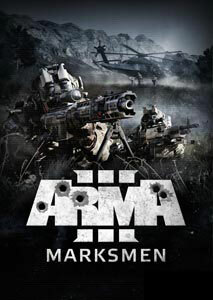 The other highlight is the DLC's "Remnants of War" mini-campaign. Here, players get to experience the long-term consequences of war firsthand, with a particular focus on the effects of mines and unexploded ordnance. 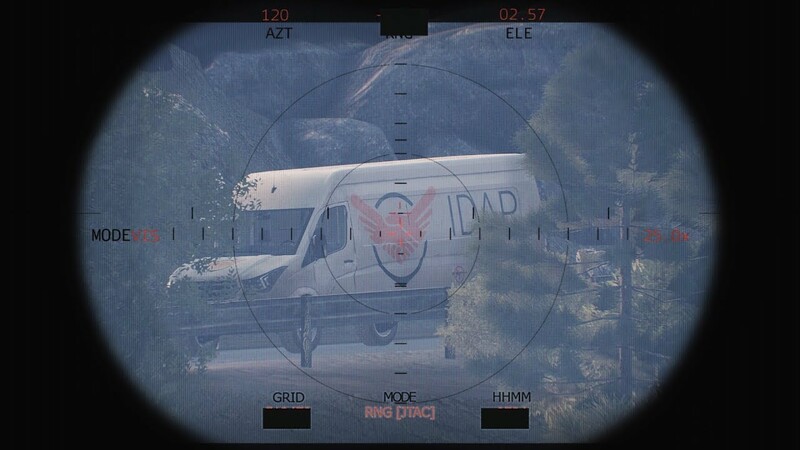 Aside from the new IDAP faction and mini-campaign, the Laws of War DLC also brought in a new van, a drone, outfits and gear, and a range of decorative objects such as shelter tents and medical or food supplies. These can be used in Arma 3's Scenario Editor (or by Zeus Game Masters) to create more authentic, diverse, and immersive missions (and lots of Steam Workshop items are making good use of the new assets, too!). 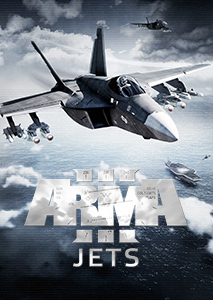 Additionally, we released a free new Showcase scenario and added new Field Manual entries so that all Arma 3 players would have the opportunity to become more familiar with the DLC's topic. 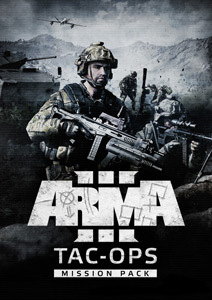 Since then we've already seen lots of Arma 3 community groups include the new IDAP faction, and the laws of war (for example by setting strict Rules of Engagement), as additional roleplay elements in their military operations. 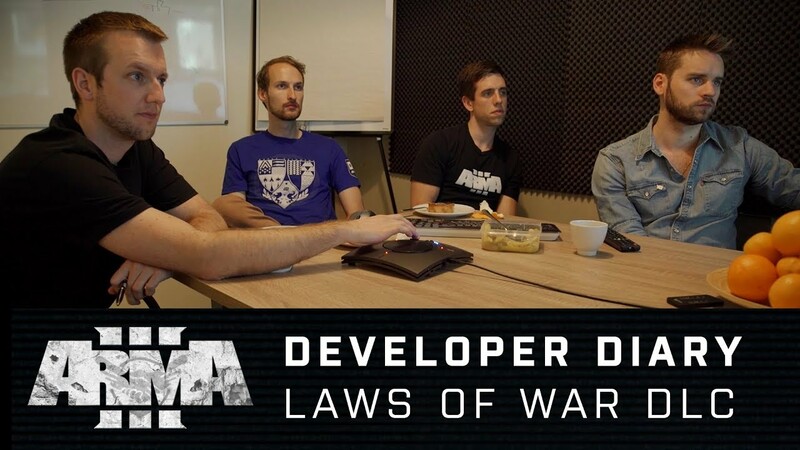 When we first announced Laws of War DLC, we were aware that it could come as a surprise. In fact, it even took us some time before we arrived at this particular subject. 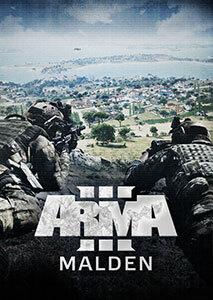 Initially, our aim with the "Orange" project was to focus on non-combat gameplay in Arma 3. After we also considered the project's relatively modest scope, we then quite soon narrowed the selection to either war correspondents OR humanitarian aid workers as a central theme for the package. 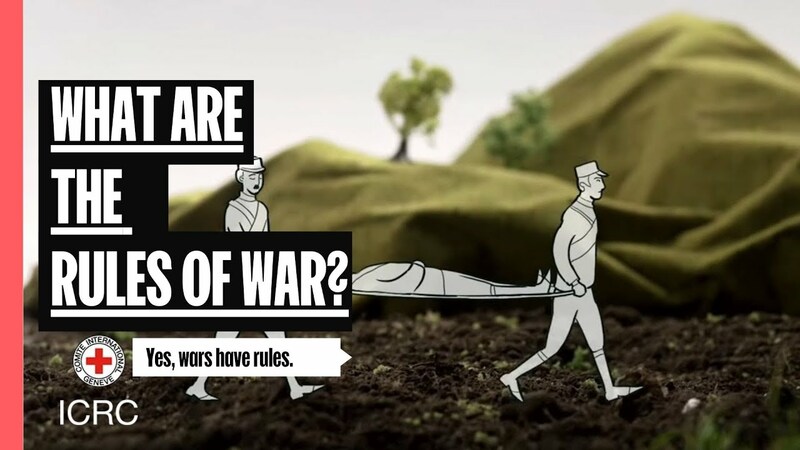 At the same time, we also felt very much inspired by the conversations we'd been having with Christian Rouffaer from the ICRC - specifically about how we could integrate core principles of International Humanitarian Law (IHL) into our games. 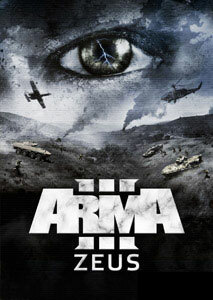 And at some point in development, all of the puzzle pieces fell into place, and Arma 3 Laws of War DLC was born. 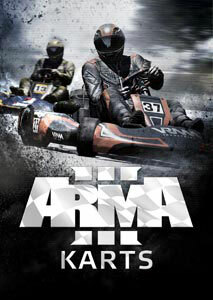 Of course, it's important to note that this DLC only scratches the surface of a very serious, and very complex, subject. If there's one thing that's become clear, it's that in war there's no clear black and white of anything. It's really more grey and grey. On the one hand, we strongly believe that, even during conflict, we should all make great efforts to hold onto our humanity - while on the other hand we also acknowledge that armed forces sometimes face impossible dilemmas in life-or-death situations. Whatever your viewpoint on all of this is, we hope the DLC offers a balanced introduction to the topic, gives you something to think about, and perhaps even stimulates you to discuss IHL further. Beyond that, it's just incredible that we were also able to seize this opportunity and make a direct real-world difference by raising money for a good cause. So, on behalf of everyone involved: thanks again for your splendid contribution! If you wish to support the ICRC further, and/or want to learn more about their activities, we very much encourage you to check out their website here. Your help is greatly appreciated!